Size: about 17 x 12.5 x 3 cm/6.69" x 4.92" x 1.18"
allowed error is +/- 1-3 cm. This thumb piano originates in Africa. It is also known as the mbira or likembe. dedicately design in sound quality - Bright, Delay and Perfect Echo. 6(C4), 7(E), 8(G), 9(B), 10(D), international standard C tune. with our product or service, no questions asked. 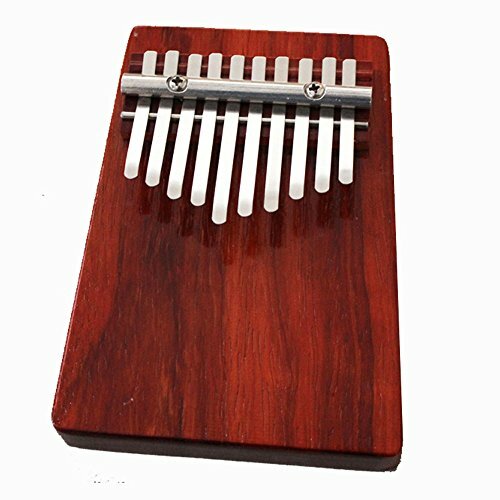 ABOUT: African Musical Instrument composed of 10 steel keys in different length. MATERIAL: It is made of Birch & Steel. It is small, handy, lightweight and easy to carry. This thumb piano has smooth surface and well polished. It is beautifully made, good size, good quality and easy to tune. FUNCTION: The main function of this small instrument is for accompaniment. ENTERTAINMENT: Fun instrument to play with and extremely relaxing to hear. Good for kids or others who want a soothing, peaceful sounding instrument. A great instrument for music lovers. GOOD AND HIGH QUALITY - Very high quality musical instrument that sounds great. The sound quality is really good. The wood and metal fits perfectly to produce good and beautiful sound. If you have any questions about this product by Pollax, contact us by completing and submitting the form below. If you are looking for a specif part number, please include it with your message.